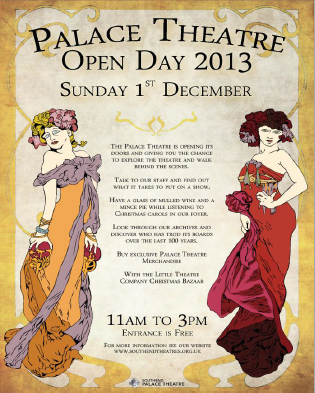 The Palace Theatre is opening its doors and giving you the chance to explore the theatre and walk behind the scenes. Talk to our staff and find out what it takes to put on a show. Have a glass of mulled wine and a mince pie while listening to Christmas carols in the foyer. Look through our archives and discover who has trod its boards over the last 100 years. Open 11am to 3pm, entrance is FREE. This page was added by Ian Grant on 19/11/2013.